Garland, Derby, and Triple Clark spend each season traveling highways and byways in their Rambler—until summer, when small-town Ridge Creek, Virginia, calls them back. There they settle in, selling burgers and fries out of Garland’s Grill after each game the Rockskippers play in their battered minor-league baseball stadium. Derby’s summer traditions bring her closer than she’s ever been to a real home that isn’t on wheels, but this time, her return to Ridge Creek reveals unwelcome news. Now the person Derby loves most in town needs her help—and yet finding a way to do so may uncover deeply held stories and secrets. Told in Derby’s unforgettable voice, this warm-hearted debut novel is about taking risks, planting roots, and discovering the true definition of home. Carter Higgins is an elementary school librarian, book blogger, and former graphic designer. 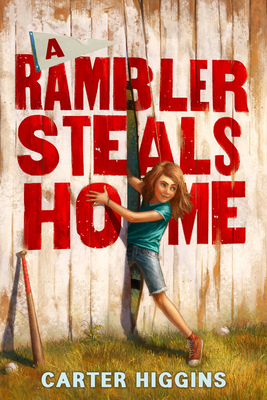 A Rambler Steals Home is her debut novel. She lives in Southern California. "This story is about as feel-good as they come, with new friendships grounded on old ones, poignant adolescent growth, and insights into family stories." "...readers will easily connect with the story’s reflections on belonging, hope, family, and the meaning of home." "Vibrant, engaging Derby and her descriptive firstperson narrative, full of lively and poignant touches, are compelling and affecting... A heartfelt, immersive debut, perfect for sports fans." "Fans of quiet, nostalgic stories about team spirit should enjoy this debut effort."